CHRISTCHURCH: In a worst act of terrorism in recent history, 10 Pakistanis, 5 Indians among 50 Muslims including 10 Pakistanis and 5 Indians in attacks on two mosques in Christchurch, New Zealand on Friday, March 15. Pakistan Prime Minister Imran Khan on Thursday, in a phone call with Prime Minister of New Zealand Jacinda Ardern, expressed his admiration for the humane way that the Christchurch terror attack was handled by New Zealand authorities. Prime Minister Khan also extended an invitation to his counterpart to visit Pakistan. During the phone call, the prime minister appreciated the quick response of local New Zealand authorities and the high level of respect shown by Prime Minister Ardern for Muslims. The man charged in the attack had purchased his weapons legally using a standard firearms license and enhanced their capacity by using 30-round magazines “done easily through a simple online purchase”, she said adding; “Every semi-automatic weapon used in the terrorist attack on Friday will be banned”. Ardern’s announcement comes less than a week after the killings, as more of the dead were being buried. At least six funerals took place on Thursday, including for a teenager, a youth soccer coach and a Muslim convert who loved connecting with other women at the mosque. 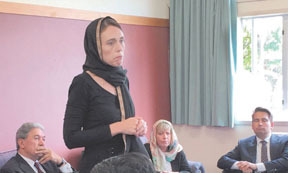 Jacinda Ardern has comforted members of the Muslim community during a visit to a refugee centre in Christchurch following Friday’s mosque attacks. A tearful Ardern said she brought messages of love, support and grief on behalf of all New Zealanders to the crowd gathered at Canterbury Refugee Resettlement and Resources Centre. “New Zealand is united in grief,” she said. At the centre, where she was joined by ministers and other politicians, she was asked for assurance around security and arrangements for mosques. She was told there was “a fear in the community” from people who just wanted to safely celebrate culture and worship. This is not Christchurch, this is not the New Zealand we know, she was told. The culprit, an Australian white supremacist, Brenton Harrison Tarrant, was run off the road and arrested by police while he was believed to be on his way to a third target. He had livestreamed the attack on Facebook and said in his manifesto he planned to attack three mosques. The Australian man, Tarrant, live-streamed footage of himself going room-to-room, victim to victim, shooting the wounded from close range as they struggled to crawl away. He also published a racist ‘manifesto’ on social media before the attack, featuring conspiracy theories about Europeans being “displaced” by immigrants and details of two years of preparation and radicalisation leading up to the shootings. 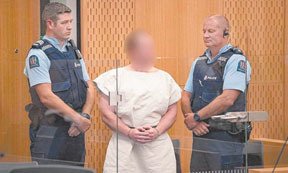 Brenton Tarrant, 28, entered no plea when he appeared on Saturday morning in a Christchurch court charged with murder after a terrorist attack on two mosques in the city. Dressed in a white prison tunic, handcuffed and flanked by two police officers, Tarrant stood passively in the dock. At one point he gazed around at the courtroom, which was packed with media. Judge Paul Kellar said although Tarrant was facing only one murder charge, it was “reasonable to assume there will be other charges”. Imam Gamal Fouda said he is expecting 3,000 to 4,000 people at the Friday’s prayer service, including many who have come from abroad. He expects it will take place in Hagley Park, a city landmark across from Al Noor mosque with members of the Linwood mosque also attending. Al Noor workers have been trying feverishly to repair the destruction at the mosque, Fouda said. “They will bury the carpet,” he said. “Because it is full of blood, and it’s contaminated.” Fouda said that he expects the mosque to be ready to open again by next week and that some skilled workers had offered their services for free. Facebook is facing pressure from New Zealand’s advertising industry and the country’s Privacy Commissioner for its role in distributing footage of the Christchurch mosque attacks. Bangladesh s cricket team escaped unscathed after a shooting at a mosque in central Christchurch. Bangladesh Cricket Board spokesman Jalal Yunus said most of the team were bussed to the mosque and were about to go inside when the incident happened. “They are safe. But they are mentally shocked. We have asked the team to stay confined in the hotel he told media.